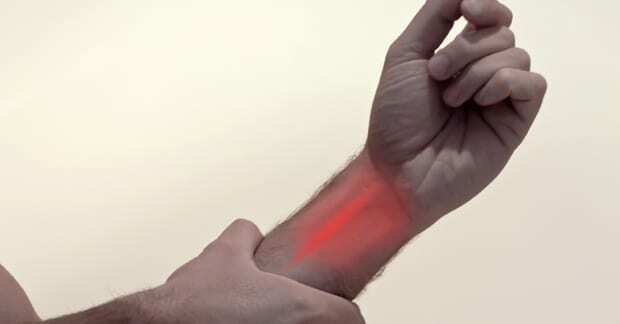 Do You Suffer From This Common Type Of Wrist Pain? Carpal Tunnel Syndrome (CTS) is a very common problem and one of the leading causes of work-related injuries. This is partially due to the advancement in technology coupled with the dramatic increase in the pace of work performance in recent decades (1). The carpal tunnel is a small space in the wrist made up of wrist bones (carpal bones) and a ligament on top, through which 9 tendons and the median nerve travel into the hand. CTS is often times caused by prolonged use of our hands and wrists (repetitive stress). As a result, there is swelling of the forearm and wrist muscle tendons inside the carpal tunnel, forcing the median nerve upwards against the “roof” of the tunnel (the transverse carpal ligament), pinching it. Symptoms initially include numbness or tingling, followed later by weakness in the muscles innervated by the median nerve. This often results in grip and pinch strength loss, the dropping of pens, difficulty buttoning a shirt, waking up at night with numbness in the 2nd, 3rd, and 4th fingers of the involved hand, and driving induced numbness. Age. Our workforce is aging (2). Kaplan reported people over 50 years of age have a greater risk at failing conservative medical treatment (3). Other problems/conditions. Obesity, hypothyroidism, diabetes, rheumatoid arthritis, and lupus (5 – Atcheson, et al). Forty percent of CTS patients were reported to have a metabolic, inflammatory, or degenerative condition that might have caused or at least contribute to the symptoms. Moreover, the authors point out that only 35 patients (11.8%) knew that they had any of these conditions. Nerve Compression. Nerve compression in the neck and/or arm above the wrist can also contribute to CTS (6). Scott, WJ. The Mechanization of Women’s Work. Scientific American 1982; 247: 162-87. Donnedly H. Percentage of Aged to Grow Rapidly. Congressional Quarterly 1981: 2330-2. Kaplan SJ, Glickel SZ, Eaton RG. Predictive factors in non-surgical treatment of carpal tunnel syndrome. J Hand Surg [Br] 1990;15B:106-108. Stevens JC, Sun S, Beard MC, et al. Carpal Tunnel Syndrome in Rochester, Minnesota, 1961-1980. Neurology 1988; 38: 134. Atcheson S, et al. Other causes of CTS. Archives of Internal Medicine 1998;158:1496, 1506-1512. Upton ARM., McComas, AJ. The Double Crush in Nerve Entrapment Syndromes. Lancet 1973; 2:359-61.